Dar Si Said was originally a mansion built by Sidi Said, royal Visir and half-brother of Ba Ahmed Ben Moussa (the former slave who built the nearby Bahia Palace), in the nineteenth century. 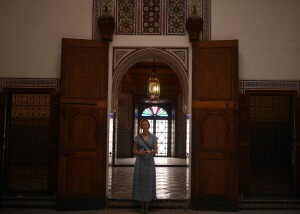 Today, the interconnecting courtyards and beautiful wooden ceilings house the Museum of Moroccan Arts and Crafts: a collection of carpets, jewellery, weaponry, pottery and textiles from Marrakech, the Atlas Mountains and across Morocco. Our personal highlights include the domed ceiling in the reception room made from carved cedar and, primitive four-seater wooden Ferris wheel of the type found in ‘moussems’ (country fairs) around Morocco. This entry was posted on Sunday, December 7th, 2014 at 9:47 pm	and is filed under Cultural & Geographical, Marrakech, Marrakech Tourist Attractions. You can follow any responses to this entry through the RSS 2.0 feed. Both comments and pings are currently closed.